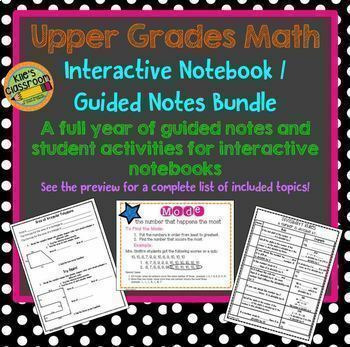 Upper Elementary Math Interactive Notebook Pages, Assessments, Exit Slips, and Activities for The Entire Year! Perfect for interactive notebooks and guided notes. Most pages are very low cutting - just trim around the edge so it fits in a notebook! NO pockets or loose small pieces! These make a great student reference because the pages actually have instruction so students can review lessons! 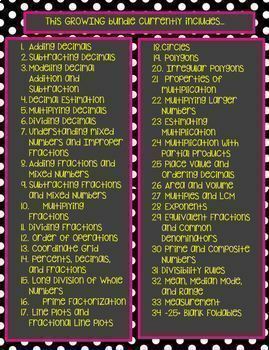 A full year of math lessons and activities that cover Common Core and State Standards. This HUGE 310+ page bundle includes interactive notebook pages for 31 topics. Many topics include assessments, exit slips, and student activities as well. This bundle also includes 22 blank foldable templates so you can add additional content to your interactive notebook! Save Big on this bundle of popular activities. Check out the FREE Circles page below (included in the bundle as well) to preview an interactive notebook page. Also, check out the Problem Trail Bundle of 6 engaging problem trail activities that coordinate with the lessons in this notebook bundle! Problem Trail Bundle. Have all your math lessons prepped for the entire year! Language Interactive Notebook Pages- Conventions- Full Year. 5th Grade Problem Trail Bundle. FREE Circles Interactive Notebook Page.